It looked like Albirex was on the way to yet another victory after second-half goals from Adam Swandi and Shun Kumagai overturned Hougang’s first-half lead, courtesy of Stanely Ng’s penalty. 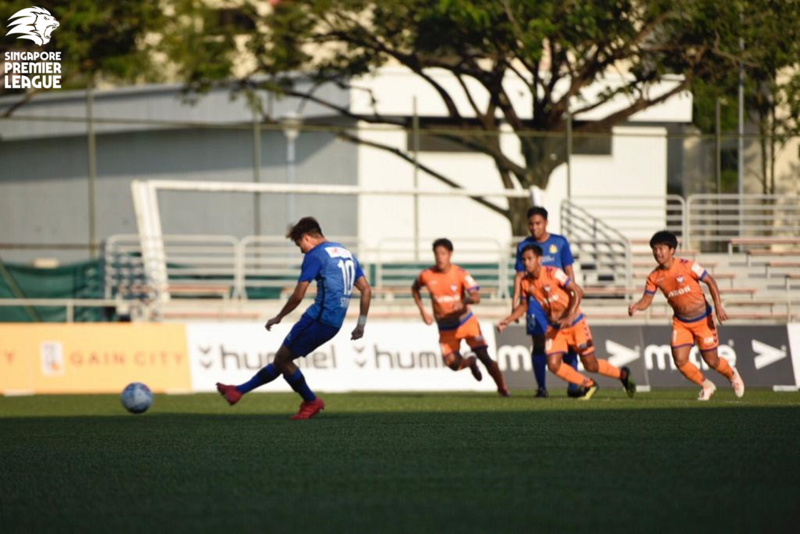 However, Hougang were determined not to be mere spectators to the White Swans’ Great Eastern-Hyundai Singapore Premier League (SPL) title party as Shahfiq’s equaliser to halted their winning run at Jurong East at 38 matches. The last time Albirex failed to win at home was in November 2015 in a 1-0 loss to Tampines Rovers FC. It was the visitors who took a surprise lead on 14 minutes. With Nazrul Nazari tripped by Kumagai in the area, Ng stepped up to send Yohsuke Nozawa the wrong way from the spot. That goal stung Kazuaki Yoshinaga’s men into action and they dominated the rest of the half, but were thwarted by the alert Ridhuan Barudin. Pulling off a stunning point-blank save to deny Shuhei Hoshino on 16 minutes, the 31-year-old Hougang custodian then tipped Taku Morinaga’s close-range shot onto the post on 28 minutes before smothering Riku Moriyasu’s left-footed drive four minutes later. Hougang were content to hit on the break and could have doubled the lead eight minutes before the break, but Nazrul lost his composure with just Nozawa to beat as Hiroyoshi Kamata got back in time to clear. Ridhuan continued to keep Albirex at bay after the break as he superbly denied Hoshino in a one-on-one opportunity and Kamata’s subsequent follow-up on 59 minutes. The Cheetahs’ resistance was finally broken three minutes later as Adam produced an opportunistic first-time shot that flew past a rooted Ridhuan. Hougang had chances to retake the lead thereafter, but Chang Jo-yoon and Fabian Kwok were unable to make them count. As the clock began ticking down, Albirex began to find more inroads and they would grab a second goal on 86 minutes. Kamata’s right-wing cross into the area was missed by Hougang centre-back Illyas Lee but not Kumagai, who steadied himself well in unfamiliar territory before slotting past Ridhuan for what looked like the winner. However, Hougang refused to cower and they got their just rewards with a memorable equaliser two minutes into injury time. Kumagai fouled Antoine Viterale and Shahfiq stepped up to deliver a stunning dead ball from 20 yards into the left corner to send the visiting Hougang HOOLS into delirium. That goal earned the Cheetahs an unlikely point and they will take heart from being the first team to stop Albirex from winning on their home turf in almost three years, as they conclude the season with a home game against Geylang International FC next Saturday. Meanwhile Albirex will now turn their attentions to the Singapore Cup semi-finals as they host Home United FC in the first leg at the same venue on Wednesday. Albirex Head Coach Kazuaki Yoshinaga: “We knew that this will be a difficult game for us… We conceded two goals from set-plays and could have lost the game. For the next four games (including Singapore Cup), we have to reflect and learn from our mistakes. This is definitely not one of our better displays this season. “It wasn’t a good week for us – some players were not well and not fully fit. It’s amazing that we could assemble 11 players to play. For Adam, I’m happy to see him score – it’s important for him to score more goals and hopefully he works on this more. Hougang Caretaker Head Coach Clement Teo: “We knew there’s going to be a party, so we told the players to come here and enjoy it. They were enjoying themselves and could have gotten more from the game. So even if we have lost, I would have been happy with their brave display. “Over the season, they’ve been trying hard – sometimes too hard. They just need to believe in themselves more and things will eventually work. For Shahfiq, everyone knows he’s a talented player. In a way, we forced him to play in this game even though he’s only 60 per cent (fit). We knew that with his talent, he can be a threat even at 60 per cent. He needs to play games and everyone was so happy with him for that goal. Albirex: Yohsuke Nozawa (GK), Riku Moriyasu, Shuhei Sasahara, Shun Kumagai, Kenya Takahashi (Kodai Sumikawa 81’), Hiroyoshi Kamata, Daiki Asaoka, Wataru Murofushi (C), Adam Swandi, Taku Morinaga (Ryujiro Yamanaka 64’), Shuhei Hoshino (Kazuki Sumiishi 89’). Unused subs: Shahul Rayyan (GK), Taiki Itsukaichi (GK), Ryuji Yamauchi, Kazuya Kojima. Hougang: Ridhuan Barudin (GK), Muhaimin Suhaimi, Illyas Lee, Faiz Salleh, Jordan Vestering, Nazrul Nazari (Fareez Farhan 68’), Fabian Kwok (C), Shahfiq Ghani, Nurhilmi Jasni (C), Stanely Ng (Antoine Viterale 81’), Chang Jo-yoon (Fazrul Nawaz 88’). Unused subs: Zulfairuuz Rudy (GK), Syahiran Miswan, Syukri Bashir, Amir Zalani.